Summer is here, the beach is waiting for us. Since weeks or months we are planning our summer holiday, looking forward to get away from the hectic of daily life. La dolce far niente, a refreshing splash in the sea, the wind in our hair, we don't need more to get in the perfect holiday mood. Just the idea of the sea side is already relaxing. So why not bringing a bit of this seaside feeling in our home and enjoy this holiday mood more than just those 2 weeks off. And we have a lot of different things to get inspired by. Beach or coastal style is a relaxed and casual way of living, Choose a soothing color palette: soft green and blue pastel tones in combination with white and neutral tones to create to perfect sophisticated ambiance. Think of water and transparency will come to your mind, look for some balls in un-perfect greenish glass. You will see they have some air bubbles in them as if water would be in. Decorate your wall with a nice big painting, some photography, and looking at them will bring holiday memories back, something you will enjoy all year round. Sailing is your passion? You can't imagine how many things you can do with just a rope. And you know to good thing about this? You can find those ropes in your local DIY or hardware store at very good price. So you are ready to create a very elegant and stylish tie back. Cotton, jutte or linen, a simple rope to bring a nautical touch in your home. Natural colors will fit all year round so you don't have to change your interior again when autumn is arriving. 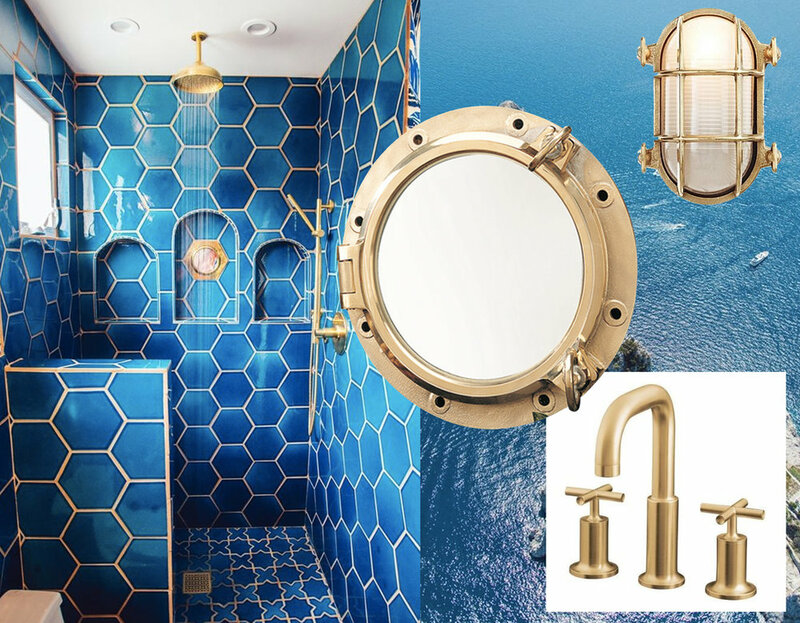 This nautical style fits different interior design styles: from rustic to elegant. When your interior is in all off-white tones and neutrals than you can easily add an accent in blue or red to create a summer feeling without having the feeling you live in a beach house. Keep the look fresh and interesting by mixing old with new. The waves of the sea and the stones at the beach are inspiring rug designers. Neutral colors versus blue tones. Washed out effects or voluminous textures, in wool, cotton or viscose., adding an interesting element in your interior. Choosing a rug can be difficult, but imagine, or just try it in the shop, walking with your bare feet on them. A rug will bring color in the room and softness under your feet. You are sportive and got really into surfing this holiday, even came home with a surfboard? But than you arrive home and have to think where to store it. The garage is the classical option, but why not make it a part of the decoration, it will bring back some joyful memories. The surfboard will also add color, in combination with natural wood bringing a more tropical mood in the room. 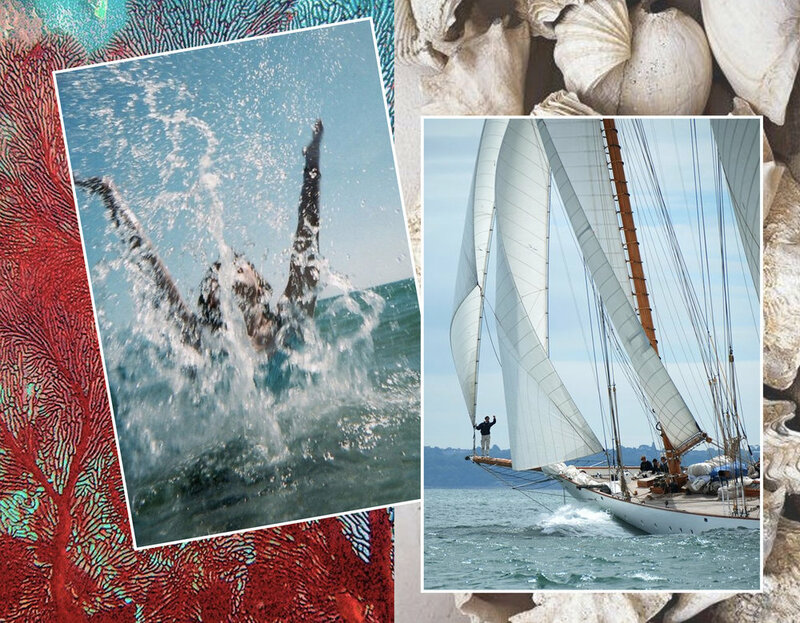 When we think of the beach we will think automatically of a nautical style: bleu, red, and white. Stripes, anchors, shells..... the good thing is that they are evergreens and will never get out of fashion. Create your summer reading corner, wicker or cane furniture are quite trendy now and fits perfectly this style. Pillows are the accessories, in general, to look for when decorating your home, as they are easy to change with the seasons. So take them out already in March and you will be ready in time for summer. Stripes can make a strong statement, they can be sportive, playful, fresh, summery. Perfect for a kids' room if you don't want to change every 2 or 3 years their room. In other cases I would keep this option maybe for the summer house or the guest room. Collecting shells at the beach and using them at home is a classical decorating tool. Did you ever think of coral as inspiration? Ok, not the real ones as they are to precious, leave them in the ocean, but we can have prints, door knobs, or even just as a touch of color. It will sparkle in combination with white, navy blue and turquoise. Maybe that white is the classical color for a bathroom, blue for sure is number two. Blue will relax us, makes us think of the sea, and wakes us up in the morning. It gets very elegant in combination with brass. And yes, we can have more ideas we can take from the sailing boat: the light fixtures and the porthole windows. And isn't holidays about enjoying? Long lunches along the seaside, fresh seafood, with a glass of sparkling wine. Add some yellow to your color palet when decorating the table, nothing easier than opening the fridge and to use what you have in the house to give that extra touch to you dining table. And you create in no time that Mediterranean feeling. Create an ambiance to feel on holiday all summer long. Have fun and relax afterwards.